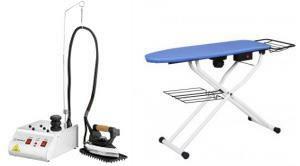 INCLUDED: Reliable 550VB Steam Vacuum Ironing Board, Heated Pressing Table 16x48½"
3 Prong Safety Plug on Boiler, Gravity irons are history! Why settle for non-pressurized steam, when you can have 50 psi pressurized steam w/ a built-in boiler/generator. 15 min. heat up to 2 hours steam. Reliable™ presents the 3000IS , the most affordable - quality pressurized steam iron system on the market. Equipped with heavy 12-gauge wiring, all stainless steel tank and outer shell, heavy-duty switches, silicone iron rest and a 1.4L size tank. The 3000IS is made to our usual high standards; and backed by our one year manufacturer's warranty (3 years on the steam tank). In the past, dry cleaners, tailors and drapery workrooms that required a stand alone steam iron had the choice between a low cost (and low performance) gravity feed iron, and a high price steam iron / generator system. The 3000IS changes all that. With quality Pressurized Steam, it is now available to everyone. The 3000IS is a revolutionary new steam boiler system, that delivers for the first time "true professional quality" pressurized steam, in a compact and economical package. The 3000IS has been designed from the ground up to deliver superior quality dry steam, and provide the best possible user experience. RELIABLE™ understands that the quality of a boiler-iron is only as good (no matter how nice it looks) as what is inside it. This is why we use the best components available including 12-gauge wiring throughout and an all stainless steel steam tank to eliminate the chance of rust. Professionals such as garment makers, dry cleaners, and tailors rely on the Reliable c88 vacuum pressing table for superior pressing results. It is equipped with a powerful and fast vacuum motor that ensures clean, crisp pressing results each and every time. The vacuum motor pulls the iron's steam quickly through the garment and table, keeping both dry. A built-in heating element also dissipates steam, keeping the inside dry and rust free. The c88 vacuum pressing table is constructed from metal to ensure stability and durability even for heavy-duty professional work. Motor mounted in the middle for better suction at the tip. Large pressing surface 16" x 48-½". Longer and wider than Hi Steam PND-1000.